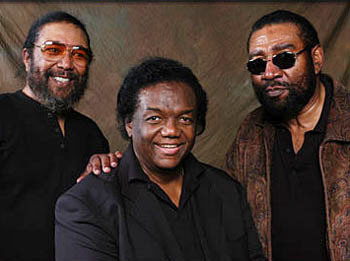 (Pictured l-r): Eddie Holland, Lamont Dozier, Brian Holland. 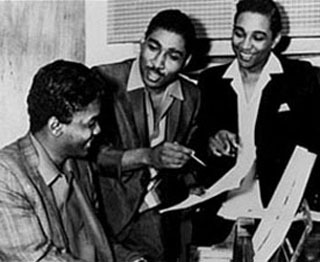 The legendary Motown team of Holland-Dozier-Holland is known for writing and producing many of the greatest pop and R&B songs of the modern era. The songs they wrote for Diana Ross & The Supremes, the Four Tops, Martha & The Vandellas, Marvin Gaye and other artists, were not only hits back in the day, but they have become pop standards for the new millennium. Collectively, Brian Holland, Lamont Dozier and Eddie Holland have written over 50 Top 10 pop or R&B hits, many which have reached #1 on the charts. It was an honor to do this interview with all three members of Holland-Dozier-Holland (aka “H-D-H”). They talked about the recent release of their 65-song, 3-CD compilation set, Heaven Must Have Sent You: The Holland-Dozier-Holland Story, on Hip-O/Universal Records. They also discussed how they wrote and produced many of their classic hits. In addition, H-D-H talked about their new projects, which includes the trio reuniting to write the music for the Broadway version of the hit movie, The First Wives’ Club. Other hits written & produced by H-D-H include: “(Love Is Like A) Heat Wave,” ”Quicksand,” “Nowhere To Run,” “I’m Ready For Love” and “Jimmy Mack” for Martha & The Vandellas; “Can I Get A Witness,” “Baby Don’t You Do It” and “How Sweet It Is (To Be Loved By You)” for Marvin Gaye; “Mickey’s Monkey” for the Miracles; “This Old Heart Of Mine (Is Weak For You)” for the Isley Brothers; “(I’m A) Road Runner” for Jr. Walker & The All Stars; “Give Me Just A Little More Time” for The Chairmen Of The Board; and “Band Of Gold” for Freda Payne. In addition, there have been numerous cover hits of H-D-H songs over the years. Here are a few highlights: “(Love Is Like A) Heat Wave” by Linda Ronstadt; “You Can’t Hurry Love” by Phil Collins; “How Sweet It Is (To Be Loved By You)” by James Taylor; “You Keep Me Hangin’ On” by Vanilla Fudge and by Kim Wilde; “Baby I Need Your Loving” by Johnny Rivers; “(I’m A) Road Runner” by Peter Frampton; “This Old Heart Of Mine” by Rod Stewart & Ronnie Isley; “Heaven Must Have Sent You” by Bonnie Pointer; “Little Darling (I Need You)” and “Take Me In Your Arms (Rock Me A Little While)” by the Doobie Brothers; and “Don’t Do It” by the Band. Here is the Q&A interview with the great Brian Holland, Lamont Dozier and Eddie Holland. All three writers were very friendly and personable, and were a pleasure to speak with. DK: Tell us about your new CD compilation, Heaven Must Have Sent You. Lamont Dozier: We’re very happy with the way it came out. It’s the first, comprehensive CD package of our songs that has been released. We couldn’t put all our songs on it, but it’s a good facsimile of what H-D-H is about. Holland/Dozier/Holland in the ’60s, during the Motown era. DK: Who compiled and produced this package? Brian Holland: It was really Universal and Richard Davis (Vice President of the Hollands’ Gold Forever Music) who came up with the idea for this compilation. We had meetings about this. We did come together on some song selections, especially in picking songs from the Invictus (H-D-H’s label after Motown) and ABC Records catalogs. Also, Barbara Dozier (Lamont’s wife) did a great job along with Richard Davis, to help put this set together. DK: So many of your songs have had such a lasting impact. When you were creating these hits back at Motown, did you think your songs would remain popular 40 years later? Brian Holland: I would be a fool if I told you I knew these songs would be so big. I felt we could be successful, but I had no idea that these songs would live as long as they have. It’s just been phenomenal. I remember saying back at Motown, “Man, I would love to write classic songs, like a ‘White Christmas’.” As it turns out, many of our songs have become classic, too. But back during that time, we were just focused on writing songs for the current project we were doing. Lamont Dozier: It was just an awesome time (back at Motown). We had a huge amount of success. During this period, whatever we touched seemed to go straight into the Top 10. It was as if we stumbled onto the best door on The Price Is Right, where the prizes just keep on coming and coming! The hits went on and on. Many of our songs have turned into beloved songs of the American Songbook. Just last night I was watching TV, and there was a movie on which had three or four H-D-H songs in it. DK: When you were at Motown, did you have a specific approach to writing songs? Who wrote the music and who wrote the lyrics? Brian Holland: I mainly wrote the melodies and tracks with Lamont, and Eddie wrote the majority of the lyrics. Occasionally, Lamont and I would also come up with lyric ideas. Eddie Holland: Early on (at Motown), Brian and Lamont were already writing together, and they were very prolific at writing melodies and producing tracks. It was the lyric writing which slowed them down. So I suggested that I join the team as a lyricist, so that their production output would be much higher. With the three of us, we were able to finish many songs and produce more projects. DK: How did you create and produce the tracks? Brian Holland: Lamont and I would start writing the songs on piano. Eddie would also be there early on, and we would discuss what the melody and structure should be. Lamont and I would then start recording the tracks, which would be the actual tracks for the master (not just demo tracks). Lamont Dozier: In the recording studio, Brian and I would split the room. Brian would work with the drummer (usually Benny Benjamin). I would get with the keyboard players (usually Earl Van Dyke or Joe Hunter) and show them how to play the track and chords. I would also give the bass lines to James Jamerson, then he would inject his own bass ideas to make it stronger. We wanted to guide the musicians, so we could create our own sound. We would never let the band just go in and play the chord sheets. We were very focused on what we had in mind for these productions. Holland/Dozier/Holland with Motown founder Berry Gordy. Brian Holland: We would record the full track, which would include the melody with a scratch vocal, without lyrics yet. Although sometimes, we would have the title, and some of the chorus lyrics. Then we would give the track to Eddie, who would go off and write the lyrics. Eddie Holland: When I got the track, I would spend many days writing. I would lock myself away. I had a townhouse in Detroit; I would close all the curtains and shades, and there was no telephone. I didn’t go out much; most of my life was devoted to writing lyrics. DK: Eddie, what was your inspiration for writing many of the lyrics? Eddie Holland: I would write these songs from my own experiences. I would write about something personal that was going on in my life at the time. I always thought that females were the most interesting subjects. I would become friends with women – I’d ask them a lot of questions. They would tell me their little secrets that they usually wouldn’t tell other men. I got a lot of ideas from what I learned talking to women. I also had a principle and approach to writing. The most important thing was the feeling; does the lyric feel right? Is it interesting, and does it draw an emotional reaction? When Brian and Lamont first gave me the track to “Baby Love,” they already had this title. At first, I thought “Baby Love” was such a trite, simple title. But I eventually realized that the title “Baby Love” worked very well with the music. The title was simple, but it felt right. DK: Was it a huge challenge, to write the lyrics to so many tracks given to you by Brian and Lamont? Eddie Holland: They were so prolific (with the tracks), that I did feel under the gun, having to come up with so many lyrics. I’ve never considered myself to be a quick writer, where the inspiration just flowed. It often took me a long time to write the lyrics – two to three weeks. Sometimes I might have 5-10 pages of lyrics; I would have many verses to choose from. I would use the most essential lines, to express what I was feeling, to express where the song was taking me. The lines that I didn’t use, I would save the lines and possibly use them in other songs. I knew that I was good at analyzing a song – how to make a song idea or lyric stronger. But with my method of piecing things together, I never felt as creative or inspired as other writers. DK: Eddie, were there any instances where you had to write a lyric on a quick deadline? Eddie Holland: Yes, writing the lyric to “I Hear A Symphony.” It was a nightmare! Brian Holland: Berry Gordy (Motown President) had given us a quick deadline to write and finish this song for the Supremes. Lamont and I did the track, and we told Eddie that the lyric had to be written in less than a day! Eddie Holland: Brian calls me a little after midnight, and he wakes me up. I was sound asleep; I was never a night person. He said he needed immediately a full lyric to be written to a track with the title “I Hear A Symphony,” and it had to be done by 11:00 am for a vocal session with Diana. Diana was on tour, and she could only be in town for one day to record her vocal. This meant that I had to stay up all night to write this lyric, and I’m not a night person! I worked on the lyric all night, and it still wasn’t finished when I arrived at the studio. I ended up teaching Diana the song, while I was still filling out some of the lines. Brian Holland: Just recently (a couple months ago), I happened to be listening to “I Hear A Symphony,” and I realized how great the lyrics were. So I called Eddie up and told him how much I liked the lyric. He said it took me 40 years to compliment him on this song! 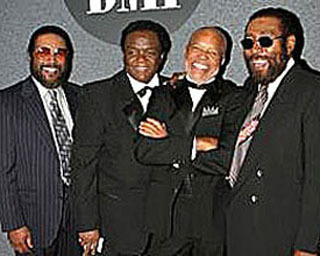 Here’s a video interview with Holland-Dozier-Holland in 2009. Eddie Holland: I finally got a compliment from Brian on this song, and it was just recently that Lamont said he liked my lyric for “My Whole World Is Empty Without You.” I said, “I can’t believe you guys. After all these years, you’re finally saying that you liked the lyric!” I remember when I was first writing these songs, I wanted their feedback. They wouldn’t really say anything. I guess I was doing a good job, because at least they weren’t complaining about how they didn’t like it. It was only decades later that they finally mentioned that they like the lyrics. Berry Gordy did the same thing. 30 years later he said, “you’re a genius!” I just had to laugh. DK: Are their certain songs you wrote, that are your personal favorites? Lamont Dozier: I have a couple favorites that weren’t the biggest hits, like “In My Lonely Room” (Martha & The Vandellas), “I Hear A Symphony” and “How Sweet It Is.” “In My Lonely Room” was just a special feeling. It brings back memories of unrequited love. When I was composing that piece, I had found a love of my life, that didn’t pan out. The girl that I was so fond of was actually named Bernadette. I was loving her from afar. These feelings transformed themselves into a hit. Bernadette — that’s the only girl song we wrote, where we used a girl’s name for the song title. As a general rule of songwriting, we tried to stay away from using a person’s name for the title. As it turned out, all three of us had girls that we loved called Bernadette. This wasn’t something we discussed at the time. We didn’t realize until much later, that we all had liked girls named Bernadette. We threw out the rule book when we wrote this song. DK: There have been many, great cover records of your songs. Are there certain ones which stand out for you? Brian Holland: There have been so many great cover recordings. I really liked Johnny Rivers’ version of “Baby I Need Your Loving.” I thought Vanilla Fudge doing “You Keep Me Hangin’ On” was one of the most creative covers of our songs. I also loved the Band singing “Baby Don’t You Do It.” I was in Las Vegas when I first heard their version. I said to myself, ‘That song sounds familiar! Oh yeah, I wrote that song!’ I hadn’t heard that song in so long. Eddie Holland: I also liked Vanilla Fudge’s “You Keep Me Hangin’ On.” The Doobie Brothers “Take Me In Your Arms” also stands out for me. And I liked the recent album that Michael McDonald recorded of the Motown songs. He’s a great singer. DK: What are some of the new projects that you’re working on? Lamont Dozier: We’re very excited about working together again, to write the music for a new Broadway musical of the hit movie, The First Wives’ Club. It will feature all new songs. We’ll have some Motown-type songs, but there will also be other types of songs. (Separately) I’m finishing a new solo album, which will be released around January. In addition, I co-wrote with my son Beau (Dozier) and Joss Stone, her latest single, called “Spoiled.” I’m also excited about a new female, country artist I’m working with named P.E. Chase, who is 15. I’ve already recorded some songs with her. Brian Holland: Eddie and I are also very excited about the The First Wives’ Club. I still write songs all the time. (Separately) I’m working with Ronnie Laws, Randy Crawford, and a great new singer named Paul Hill. Eddie and I have also signed with CAA (Creative Artists Agency) to develop more music and movie projects. DK: Lastly, what advice would you give to new songwriters and producers, who are trying to break into the music business? Brian Holland: Berry Gordy always said, “listen to the radio.” It’s important to get a pulse on what’s going on out there. Listen to different sounds for production ideas. Be inspired by great songs and great production. Lamont Dozier: Young writers should definitely research the current sounds and styles. They also need to realize that a song is a mini-story, with a beginning, a middle and an end. It has to have a complete, meaningful story. The song’s story and theme has to be universal, so that listeners can identify with it. A hit record is a song that almost everyone can identify with.